While the road going Corvettes of the 1970s were largely weak sauce, there was at least one bright burning light in the Corvette world and that light was emanating from the shop of John Greenwood who was building a series of 12 Corvettes that would be seen at tracks like Sebring, LeMans, Daytona, and other iconic courses across the world. These thundering monsters were powered by aluminum big block engines of varying displacements and were some of the most brutally fast cars of their era. Sure they didn’t exactly lead the league in reliability but when they were working the Greenwood Corvettes were often found at the front of the pack, breathing down the necks of foreign stuff and often times intimidating those cars right off the track with a bellowing exhaust note that was like nothing else out there at the time. John Greenwood turned out a total of 12 racing Corvettes and the car we’re about to ride in is chassis 012 or the last one made. Completed in the late 1970s it was leading a pretty charmed life as a display car before it was finally put into racing mode in the early 1990s and it has been driven in anger ever since. Here you will see the car turn speeds of 175+ when up on the banks and make all those great big block noises while accelerating off the curves in the more technical portions of the track. The speed readout is in KPH so don’t freak out when you see 275 show up on that screen. We’re thinking that the driver is European and that he’s likely more comfortable with that readout when in the seat of the car. Just a guess on our part. This car totally rules and the history behind it does as well. John Greenwood has since passed away but it is great to know that the legacy he created in the 1970s is still a big part of the vintage racing scene today. 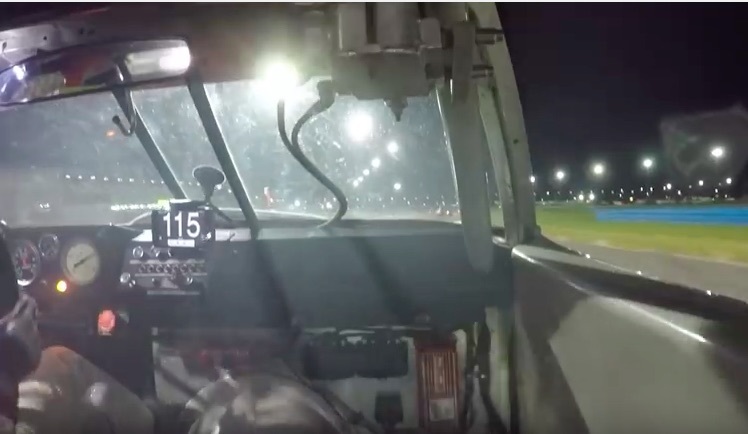 We’re be remiss if we did not mention that this footage comes from the HSR Classic 24 at Daytona which was contested in November. We could watch this one on a constant loop for days! An old friend was a crew member for John after working his day job as an engineer at GM. There ARE stories! My favorite is that coming out of the pits John sometimes shifted so hard that he’d break the Hurst shifter handle right off (I’m guessing that the bolts broke). No wonder the cars had a history of breaking!